Your Samsung Tab S2 NOOK can find images online — but you have to have an active Wi-Fi connection. 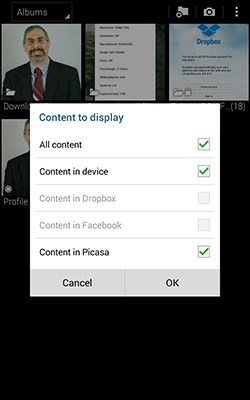 You can limit your image search to Facebook, Dropbox, and Picasa, if you want to. Make sure you have an active Wi-Fi connection. From the main Gallery screen, tap the Menu (three dots) icon in the upper right. Choices are based on which services you use. All Content. Every image your tablet can find, from the Tab S2 and its memory card, to online sites you subscribe to. Content in Device. Only images that are stored on the tablet itself. Content in Dropbox. If you subscribe to Dropbox and you put images there. Content in Facebook. Images you posted on the wall or timeline of your Facebook account. Content in Picasa. If you have an account with Google’s photo editing and storage site, and you’ve put images there.